Earth or Planet Earth is a planet that features a wide variety of people, cultures, and ecosystems. 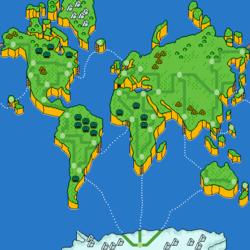 While the Earth that appears in Super Mario has some features derived from the nonfictional entity, fictional alterations to the planet have been applied in the series. The planet has been referred to as the "Real World" by citizens of the Mushroom Kingdom in the cartoons. However, this is no longer addressed in recent material, meaning that the real "Earth" and the Mario version of Earth are now instead considered as being the one and the same. Planet Earth is featured as the setting of the Mario & Sonic series, in which species from the Mario games are also present on Earth. It also is the setting of Mario is Missing!, in which Luigi must travel around the globe on a hunt to rescue Mario and save the world. Original map of the real world. Earth is organized into seven continents whose borders are based on geographical features rather than political boundaries. Continents are not necessarily separated by water. With the exception of Antarctica, each continent is further subdivided into countries, political bodies ruled by a government. Several countries are in more than one continent. The subdivisions of countries vary, but every country has population centers such as towns or cities. Africa is home to both sandy deserts and lush rain forests. Its nations include but are not limited to Egypt, Morocco, Nigeria, South Africa, Kenya and Ethiopia. Humans and a variety of exotic animal species inhabit this continent. In the The Adventures of Super Mario Bros. 3 episode 7 Continents for 7 Koopas, Kooky goes to Africa, where he turns all the animals there into stuffed animals. Antarctica is a large icy, ferociously cold desert continent located at the southernmost point of the planet, mostly populated by penguins. It is the only continent that does not have specific countries ruling portions of it; however, it has territories that are owned by Argentina, Australia, Chile, France, New Zealand, Norway and the United Kingdom. There are also some islands along the Antarctic plate that are associated with the continent of Antarctica; these are claimed by Australia, Norway, France and South Africa. In 7 Continents for 7 Koopas, Big Mouth is sent to Antarctica, where he builds an Abominable Snowkoopa that goes around scaring penguins. In Mario is Missing!, Bowser attempts to melt Antarctica in a plot to flood Earth. The largest continent, Asia is home to a variety of countries, including Japan, China and India. The Great Wall of China is one of the continent's most famous landmarks. In 7 Continents for 7 Koopas, Bully is sent here and does graffiti on it. China's nation capital, Beijing, was the location of the Olympic Games in which Mario, Sonic the Hedgehog, and others competed during the events of Mario & Sonic at the Olympic Games. Tokyo will be the location where the Mario & Sonic cast will compete during the events of Mario & Sonic at the Tokyo 2020 Olympic Games. The smallest continent on Earth and its largest country is Australia, which is home to a variety of animal species, including Kangaroos. Alligator Dundee originally lived on this continent. It is often referred to as "down under" due to its location in the southern half of the planet. In 7 Continents for 7 Koopas, Cheatsy is sent here and he turns almost all the humans into kangaroos, except one of them, of whom he turns into a shrimp, where all the crocodiles (which are standing up) go ahead and chase him to eat him up. Europe shares a land mass with Asia, separated from it by the Ural Mountains. Famous for its varied culture and large role in Earth's history, Europe is divided into countries such as France, the Netherlands, the United Kingdom, Russia, and Italy. Famous cities include Paris and Venice. In 7 Continents for 7 Koopas, Kootie Pie is sent to the Louvre in France, where she turns famous paintings into paintings of her (Mona Kootie Pie, etc). England's capital city, London, was the main setting for Mario & Sonic at the London 2012 Olympic Games, where the 2012 Summer Olympics took place. In addition, the Russian city of Sochi was the main setting for Mario & Sonic at the Sochi 2014 Olympic Winter Games, where the 2014 Winter Olympics took place. North America is the location of the United States of America, Canada, and Mexico, among some other nations. The United States of America is home to many famous and influential cities and other locations, many of which were featured in The Super Mario Bros. Super Show! and The Adventures of Super Mario Bros. 3. These include Brooklyn, which is sometimes depicted as the place where Mario and Luigi used to live, Washington, D.C., the nation's capital, Hawaii and the Kennedy Space Center. The Canadian city of Vancouver is the location of the game Mario & Sonic at the Olympic Winter Games. In 7 Continents for 7 Koopas, Hip gets sent here, where he steals a TV station and refuses to come off until all the North Americans give him their money. A largely tropical continent, South America is famous for the Amazon rainforest. Countries include Argentina, of which Buenos Aires is the capital. "7 Continents for 7 Koopas" portrayed a part of South America's human population as primitive, spear-chucking hunter-gatherers. In 7 Continents for 7 Koopas, Hop is sent to the Amazon, where he turns the jungle into a parking lot. This may reference to loss of wood in the Amazon, among other rainforests. One of the continent's main cities, Rio de Janeiro, in Brazil, is also the main setting for Mario & Sonic at the Rio 2016 Olympic Games, where the 2016 Summer Olympics takes place. The Super Mario Bros. film features an introduction that outlines the rule and extinction of the dinosaurs on Earth. Dinosaurs used to live the good life, superior to the small mammals who also inhabited the planet, until one day a gigantic meteor struck the planet, supposedly destroying the dinosaurs. The world was divided into 2 dimensions. However, the narrator then asks the audience to consider a "what-if" scenario based on if some of the dinosaurs went to the other dimension and evolved a society there, as shown in the film. As the plot of Super Mario Bros. is a "what-if" scenario, the applicability of this piece of Earth's history to the rest of the Super Mario series is unknown. Nintendo has yet to comment on this matter. 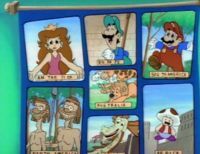 In some representations of the Mario brothers, including The Super Mario Bros. Super Show!, Mario and Luigi lived on Earth (sometimes referred to as the "Real World") and ran a Brooklyn plumbing business: Mario Brothers Plumbing, but later arrived in the Mushroom Kingdom via a Warp Pipe. Many of the brothers' relatives lived on the planet as well, including Mama Mario and Papa. Mario and Luigi's plumbing business was moderately successful. How the brothers came to leave Earth in these portrayals of them is somewhat inconsistent. As revealed in "The Legend," the brothers left Earth for the Mushroom Kingdom upon hearing a call for help through the pipes in Mario Brothers Plumbing. According to the introduction to The Super Mario Bros. Super Show! and "Toddler Terrors of Time Travel," the brothers happened upon a Warp Zone to the Mushroom Kingdom while performing a house call, and were sucked down. This second explanation was later modified through the power of Ludwig von Koopa's Time Travel Tube, but no major changes were made to Earth's history. The games Super Mario World 2: Yoshi's Island, Yoshi's Island DS, and Mario & Luigi: Partners in Time have all confirmed that Baby Mario and Baby Luigi lived in Mushroom Kingdom. This conflicts with the explanation that Mario and Luigi are from Brooklyn. Various characters racing across Earth. This artwork was made for Mario Kart DS, and it refers to the worldwide Nintendo Wi-Fi Connection. 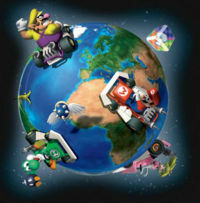 Official artwork for Mario Kart DS depicts various characters racing and battling on the Earth's surface, visually demonstrating the worldwide scope of the Nintendo DS' Wi-Fi capabilities. In Mario Kart Wii, Earth appears while the player is waiting in the Nintendo Wi-Fi Connection and in the Rainbow Road course of the Special Cup. The planet is located in the background of the course, underneath the track. If the players accidentally fall off the course, they will fall to the void by the gravity of the planet, instead of floating in space. In Mario Kart 7, like Mario Kart Wii, Earth appears while the player is waiting in the Nintendo Wi-Fi Connection. It is also there in the Mario Kart Channel. In Mario Kart 8 and Mario Kart 8 Deluxe, Earth is still shown when the player plays online. Also, like Rainbow Road in Mario Kart Wii, Mario Kart 8's Rainbow Road is set above Earth, along with a Blooper spaceship and MKTV satellites floating in space. A globe of the Earth can be seen in the background of the Mario Kart 8 version of Ribbon Road, due to it now taking place inside a child's bedroom. Wario refers to the area below the Awazon as "deep within the Earth" in the manual of Virtual Boy Wario Land. In Mario Party 7 and Mario Party 8 (in a minigame in the latter), the Earth can be seen. In Mario Party DS, there is a minigame where players run on a globe and shoot opponents. The Earth appears in the maps of the Astro Avenue and Rocket Road boards from Mario Party 6 and Mario Party: Island Tour, the former being the starting space, and the latter in the map's background. The Earth's atmosphere can be seen in the background during the battle against Raphael the Raven in Super Mario World 2: Yoshi's Island. The Earth can be seen in the background of Galaxy Arena in Mario Tennis Open. In the WarioWare series games, Wario has a map of the Earth inside his house. Additionally, the Earth appears in the opening and closing cutscenes of WarioWare Gold. The Earth also appears in the microgame "Shave the World" from WarioWare: Twisted! and WarioWare Gold. In Super Paper Mario, on Chapter 7-3 if either Mario or company jumps on Cyrrus, they will be sent into orbit and back down to Earth, which is seen in the background. In The Super Mario Bros. Super Show!, Mario and Luigi often try to find their way back to Brooklyn (their hometown in the cartoon series) usually via a Warp Pipe. Towards the end of the series, the Mario Brothers decide to stay so that they can protect Princess Toadstool and the Mushroom Kingdom. Additionally, the live action sequences take place in Brooklyn. The first and last parts of the Super Mario Bros. film are also set in Brooklyn. Additionally, in The Adventures of Super Mario Bros. 3, many episodes featured characters using Warp Pipes to travel back and forth between the "Real World" (Earth) and Mushroom Kingdom. In the episode "7 Continents for 7 Koopas", Bowser assigns each of his seven Koopalings to take over one of the Real World's continents. Notably, after all the trouble is undone, a screen is shown with non-native animals in the Australia section. Also, Bowser is seen in the Real World yet again in a flashback sequence from the Super Mario World episode "Rock TV". Earth in Donkey Kong Jungle Beat. During the events of the Club Nintendo comic "Donkey Kong in: Banana Day 24", aliens erroneously took Earth for a giant coconut, and since they adored this kind of fruit, they took the planet with them, pulling it away from the sun. This resulted in a sudden drop of temperature all over the planet. When Donkey Kong and some of his friends talked to the aliens, they returned Earth back to its original position. In the comic "Die Jagd nach dem Nintendo 64: Krawall im All", from the same magazine, Mario and Luigi traveled through space in search for a new spaceship. They finally found it on Earth (which Luigi referred to as "Planet Terra"). In Donkey Kong Jungle Beat, Earth can be seen in the background during Asteroid Belt and the fight with Sumo Kong. A full view of Earth during the last cutscene of Super Mario Galaxy. Earth is the setting for World 1 in Super Mario Galaxy 2. Due to those two games being set in space, the Earth is often seen in Super Mario Galaxy and its sequel. In the former game, it is shown primarily in the opening and ending cutscenes, where it is the location where the Star Festival is held, and is first shown from space when Bowser kidnaps Peach and removes her castle from its foundation and carries them both into space, causing Mario to follow them into space as well. Additionally, Earth is the setting of Grand Finale Galaxy, the final galaxy in the game due to it involving Mario returning to the Mushroom Kingdom. Earth also returns in Super Mario Galaxy 2, where it is the main setting of the game's first world, while other real places in space are featured as the settings of later worlds (such as the Solar System in World 2, the Orion Arm in World 3, the Milky Way galaxy in World 4, the Local Group in World 5, and a black hole/quasar in World 6) except for World S, which features a planet with star-shaped islands instead, as well as in the backgrounds of the first two Bowser Jr. galaxies (Bowser Jr.'s Boom Bunker is the exception, which features a Sun in the background instead). Earth as seen in the background of World Star in Super Mario 3D World. 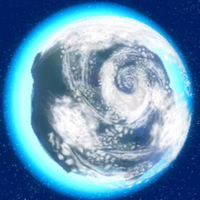 The Earth also appears in the backgrounds of Worlds Star, Mushroom, and Flower in Super Mario 3D World, again due to those levels being set in space, explaining Rosalina's appearance in this game. Earth as the level select in Super Mario Odyssey. The Earth is featured primarily in the game Super Mario Odyssey, where Mario and Cappy must travel the world in a hat-shaped airship called the Odyssey as an attempt to stop Bowser's wedding to Peach as well to try and save Cappy's sister Tiara (who was also kidnapped by Bowser for the wedding), even being the "O" in "Mario" on the game's logo. In this game, the Earth looks completely different than how it appears in real life, with the western hemisphere featuring a landmass resembling Pangaea and the eastern hemisphere featuring landmasses resembling Laurasia and Gondwanaland, as well as islands shaped like a top hat, a Triceratops head, a flower, and a mushroom. The game features various kingdoms serving as stand-ins for real countries and cities such as London, England; Mexico; Greece; possibly Germany, New York City, NY; Russia, the French Riviera; Italy; and Japan. 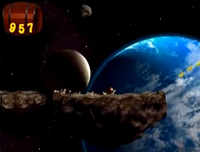 The Earth also makes an appearance in the background of the Moon Kingdom, where it is seen rising from the horizon, while its southern hemisphere is seen during the escape sequence after the final boss fight, where Mario (controlling a captured Bowser), Cappy and Peach must try to find a giant spark pylon in order to escape the collapsing Wedding Hall. Additionally, the Odyssey features a globe that allows Mario to travel to a different kingdom by throwing Cappy at it. The commercial for Super Mario Bros. 3 features thousands of children on the Earth's surface forming a giant Mario face spanning the United States when the Earth is seen from space. The Earth appears the backgrounds of the box arts for Super Mario World (Japanese version) and Super Mario 64. In the Super Mario Bros. live-action film, an alternate, unnamed version of Earth is revealed to exist; this parallel Earth was brought into creation when a meteorite struck the true Earth, causing spatial and dimensional disturbances, resulting in the creation of the alternate Earth, which the dinosaurs, at least those who weren't killed, and a few other creatures were flung to. On this Earth, various types of dinosaurs evolved into humanoid creatures, though some, such as Yoshi, seemed to have retained their reptilian forms. Aside from one rundown city, Dinohattan, this Earth is a desert wasteland, lacking various resources. This page was last edited on April 17, 2019, at 20:44.